Did we even HAVE an offseason? It's debatable. We finished up the 2017 season, finishing as part of the Houston Newton Alliance (Finalists). And we weren't satisfied to just walk away. We were contacted in early June by FRC, inviting us to join the winning Houston alliance at the FIRST Festival of Champions! Wow! That was so unexpected. After returning from New Hampshire, we still weren't finished. The TOTAL Solar Eclipse was coming. Prep for the eclipse started right after school started. The eclipse was an amazing opportunity. We traveled to Kentucky, where we launched two balloons, complete with sponsor materials (and more importantly four experiments being tested in totality). ​The Columbus event is special each year, especially because our friends and families get to see us compete.. As the weekend progressed, CSP was matched with IHOT in the eliminations, and we were able to get to the semi-finals where an issue with USB eliminated us. All in all, it was just bad luck. But we saw amazing success on the awards side. This weekend, we won the Chairman's Award for the first time in our history. The second Deans List semi-finalist in our history (Skyla B) was announced this weekend as well. PCH added a fifth event this season -- Duluth event, which we joined. We also took over the Georgia FIRST social media. We had our first successful robot weekend, reaching the finalist alliance this weekend. Finally, BREAKOUT was performing as needed and expected. We were psyched that Chris Tucker attended the event, and best of all he signed BREAKOUT! The second year of district play in Georgia was something beyond anything we'd imagined. We started the season with a week 1 competition in Gainesville. We competed as first pick for the first seed alliance, and were selected as the Engineering Inspiration winner for the competition. We were excited because the season was progressing beautifully. A couple of weeks later, we were back in Columbus to compete. We were selected to join the alliance with OTTO and finished as finalists. We also managed to get our first Pit Safety award. What a start! The week later, we returned to Albany.. There, we allianced with Walton to WIN the event (and get another Safety Award). That new pit layout was definitely working, and our cheesecake was a favorite for everyone who tried it. We were excited to go into District Championships on a winning streak. At championships, we finished as the finalists, losing to two of our previous alliance captains: RoboBibb and OTTO. That's nothing to be ashamed of. Better still, we had our first Dean's List Finalist and our first Engineering Inspiration District win! What a way to go into World Championships at Houston! We were scared and excited to see we were returning to the Newton field, playing with powerhouses like Robonauts (team 118) and Citrus Circuits (1678). And what a fortuitous placement that was! In fact, those teams selected us as their third robot for the playoffs. And that was just the beginning! The first seed alliance on Newton (yeah, that was us!) won!!! We along with two other PCH teams progressed onto the Einstein field. Can you believe it? Destination Einstein came true. And, better yet, CSP finished as the finalists of the entire Houston Championships! We never imagined we'd be disappointed to come in second in the world. :-) But believe it or not, we weren't finished. At the beginning of June, we were contacted by FIRST. Turns out one of the teams on the champions alliance for Houston was unable to make the inaugural Festival of Champions competition in New Hampshire and who do you think they picked to replace the team: Yeah, us! Houston finished the season in July in New Hampshire as the finalists for FoC. Wow! can it get better? Oh we hope so. ​The first District Qualifier in Georgia was held right in our hometown of Columbus, Georgia We were proud to win the event as part of the 4th seed alliance.. Week 4 took us to the inaugural Rocket City Regional, in Huntsville, Alabama, where we were excited and anxious to compete because we'd be seeing teams from eleven states, including the legacy team Bomb Squad (16) and the reigning World Champions Robonauts (118). Eventually we captained our third seed alliance to a tough playoff, with our eventual loss in the Finals. Since Bomb Squad and Robonauts were already qualified for Worlds, that opened up two Wildcard spots -- and they went to us and our alliance partner, team 364. The District Championships in Athens was a great learning experience and a terrific opportunity to take some chances and push ourselves. On Friday night, we were excited to find out that head coach Mr. Richardson was selected as the Peachtree District Woodie Flowers Award finalist!!! What a great way to earn our fourth banner (second this year)! We didn't end the competition like we wanted but we were happy with our new banner, our second qualification for the World Championships. 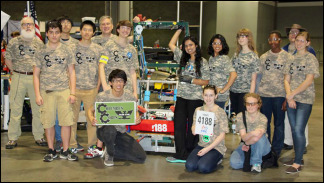 A few weeks later, we joined the Curie field to compete at the Championships for our second year in a row. The 2015 Season was the season of Worst to FIRST! We attended the Perry Regional competition in week 1, ending up 42nd out of 42 teams! We went home, reviewed our strategy and used our DE field to practice. Four weeks later, we went to the Peachtree regional in Atlanta. After round one, we were in FIRST! We went into the playoff selection in 2nd. From there, we continued to improve, thanks to our amazing alliance partners! A month later, with the help of several new sponsors and the support of our local media and political partners, we headed to St. Louis for Worlds. At first, it looked like an ugly repeat of Perry. After day one, we were struggling mightily. However, day two in the first match of the day, we had an amazing turnaround. In the end, we were selected to join an alliance in the playoffs. That was the end of the road for us, but what an experience! The 2014 team was a great success, though it changed from a community team back into a single school team -- not by choice but by chance. All of the members came from Columbus High School, except one who was a middle school student. Finding mentors from other schools became a problem. We also moved around to new workspaces a lot this year. We did, however, make it to the runner-up alliance at Peachtree Regional, missing World's by 10 points!!! In 2013, we saw our largest team to date, with members from eight schools around Columbus. Probably our favorite thing about this year was that we reached out to students who normally don't participate in STEM activities and got them involved. One of our drive team came over every day after football then basketball practice to participate. From this team, we had four students who would eventually go on to be their school's STAR Student (highest SAT) score. 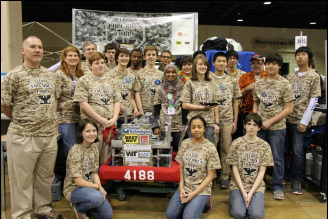 Technically, 2012 was our rookie year, and included our most recent MIT InvenTeams selections. We were a new team, made from two previous teams from Northside High School and Columbus High School, and including Spencer High School. It was meant to be a community-wide team. We had team members from multiple schools, but mostly Northside and Columbus. 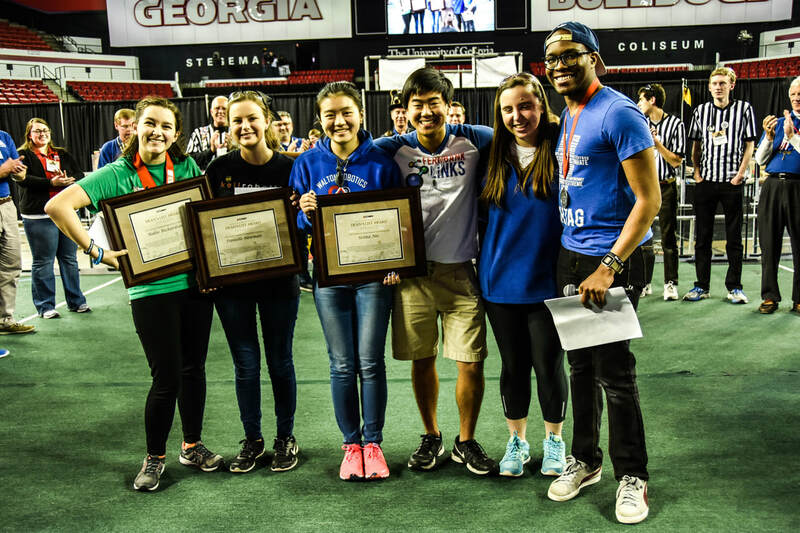 At the Peachtree Regional, we were awarded with the Rookie All-star Award, awarding the team with a trip to World's in St. Louis.